Pergola Materials & How our system Works! We have a 3D model application that will allow you to better visualize what your aluminum louvered pergola will look like in your new outdoor living space. Create a multi-functional space with our unique louvre system. Control ambient temperature. Control sunlight intensity by adjusting the louvres to your comfort level. Protect yourself from inclement weather by closing the louvres completely to create a watertight ceiling. 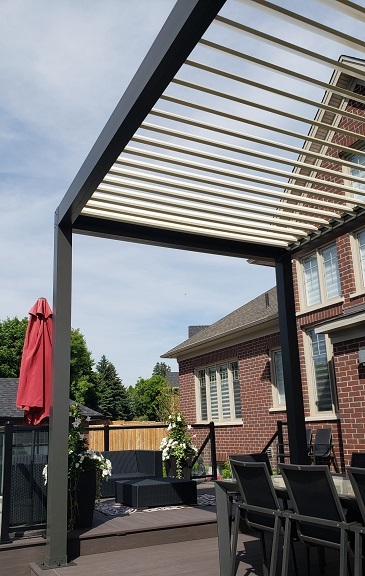 Our aluminum louvered pergola system offers you the adaptability to extend the use of your outdoor space through multiple seasons and weather conditions. Our unique design also allows for add-ons such as heaters, lighting, privacy shades, insect mesh, and outdoor audio visual integrations. Because of its construction all element sensitive components are run through the structure providing protection and maintaining a clean finished aesthetic. Rain drains through a trough system that is built into the structure and exits via out spouts that are installed, directing the water away from you and your guests. Our louvers allow you to adjust the amount of light you are exposed to.